The above prices are subject to an additional $102 for taxes/fees levied on flights that occur as part of the tour. The internal airfares ARE included (any exceptions are listed in red below), but we list the taxes separately on your invoice as they are beyond our control and can change at any time. Entry/VISA requirements for one or more of the countries visited require that your passport not show any evidence of a prior visit to Israel. Optional Single Supplement: $2047 USD (number of singles limited). This tour may require a mandatory single supplement charge of $1047 if you join our share program and we are unable to pair you. Somewhere between the clash of a rich prehistoric culture and that of a thriving urban centre is a region quite unlike anywhere in the world. Our Arab Gulf States tours embark on a journey to a land reborn, where money is of little object, architectural dreams come true, yet traditions are held in high regard. It is a region that is constantly misunderstood until it is visited and explored. Historically, the Arab Gulf was inhabited by nomads who yielded cultural treasures for thousands of years in the desert landscapes they roamed. On our Arab Gulf States tours we visit museums full of ancient stonecutters' tools, expertly crafted and hand carved wooden boats, ceramic incense burners dating back thousands of years, glittering jewelry fit for royalty, and decorative pieces made from copper, iron, gold, that show a history dating back from 125,000 years of human history. In both ancient and modern times, local life is best experienced at the vibrant souk (market). From the falcon souks dedicated to the exotic sport of falconry, to the cattle markets where every agricultural product and animal is up for sale, there is no better way to see the locals interact with one another than at the souk. In Oman, we get lost in the stunning variety of scenic beauty. Windswept beaches are the perfect backdrop for ancient fortresses. Date plantations grow on the sides of dramatic mountains with incredible canyons to peer into. Historic dhow ships guide us through calm waters in natural fjords that are turquoise in colour, while 4x4 jeeps whisk us away to sand dunes that extend as far as the eye can see. Known as the land of Frankincense, Oman tours take us back to from the time of Queen Sheba to a curious look on how a sultanate nation can keep its traditional identity while still modernizing its country. 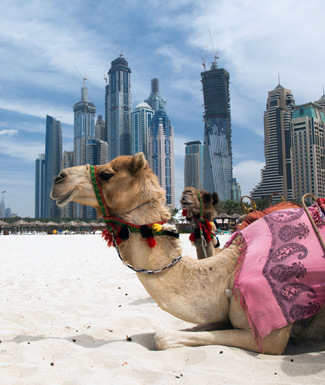 In the UAE, our United Arab Emirates tours travel across the several cities found in the Arabian desert. From the capital of Abu Dhabi, with its magnificent mosque and fascinating museums, to the gold souks that lay in the shadow of the world's tallest building, the Burj Khalifa, found in Dubai. They are cities in a land of human-made wonders, where every year the maps are outdated due to the constant demand for reinvention and growth. If the UAE is all things modern at a booming pace, then enjoy the contrasts on our Arab Gulf States tours with the step back in time in Kuwait. The Gulf War of the 1990's is becoming a distant memory, however, effects of the war still plague the development of this region. Debts to be paid off meant that glitzy projects like that of Dubai have been on hold, and the nation enjoys a much quieter and refrained existence. In Bahrain, the blend of modern and ancient is more noticeable as is the links to the past which had this nation as an important trading post in trade routes between Sumeria and the Indus Valley as long as 5,000 years ago. Away from the Manhattan style skyline of its capital, are thousands of years old fortresses and 170,000 burial mounds dating from between 3,000 BC and AD 600. From ancient to modern, natural to urban, our Arab Gulf States tours has a little bit of each that create a journey beyond memorable. I especially enjoyed seeing Oman, since the North, South, and Central areas showed some of the differences within one country. The local guides were, across the board, excellent. The transportation was comfortable, dependable, and drivers were very courteous, helpful, and pleasant. We had one of the best tour leaders ever, and I have been on a hundred trips. A great trip, the people I know who've seen the grin on my face know that I've enjoyed my trip, ALOT ! It was an amazing and wonderful trip to an intriguing part of the world. It was really interesting to see the differences between the countries we visited. Each country was great but Oatar and Oman were my favourites, mostly because of the connection with the explorers Ibn Battuta and Wilfred Thesiger. I felt the trip was well planned and executed. Great Tour Leader. It covered a number of countries, areas not the easiest to understand and work with. We definitely were getting our monies worth for the trip. The vehicles for 4X4 were very good and it was a thrill to make those two trips in the dunes and over the narrow road from Niswah to Muscat. Highly recommend Laura for her services as a first class tour leader. She was very down to earth with conversations with everyone. Favorites were: Tareq Rajab Museum in Kuwait, visiting the Grand Mosque in Bahrain, in particular due to the young woman who patiently explained Islam (in brief) and answered our questions, Bahrain's excellent National Museum, Sheikh Zayed Grand Mosque in Abu Dhabi, the Burj Khalifa in Dubai (actually most everything in Dubai), the dhow cruise in Khasab, Sultan Qaboos Mosque and Old Souk in Muscat, the visit to Sur, our stay in the Wahiba desert, our drives in the Al Hajar Mountains around Nizwa, the coast near Salalah. The transportation was good. The drivers were good. The evening meals were always excellent. I thought the quality of the hotels was always very good to excellent. I enjoyed the trip very much. We had a good introduction to the essential sights of these countries and the local guides were all good at sharing information and insights. The Khasab area was remarkable. Loved the 4X4 excursion into the Musandam Peninsula. Loved the Jebel Shams Grand Canyon Area. Really enjoyed exploring the lost city of As Sab and the other mountain villages in the area. All of the guides were very good. Our tour leader was super. She obviously loves her job and loved making sure we had an enjoyable trip. Excellent knowledge and very pleasant. The hotels were very good. Great trip. Laura was excellent and provided supplemental information above and beyond what the local guides provided. Her detailed knowledge of customs, traditions, history, and 'things and places' greatly enriched the trip. A positive experience for me. I am glad I took the trip. Today we arrive in Kuwait City. The economic, cultural, and political capital of Kuwait, Kuwait City sits on the shores of the Persian Gulf, and is a mixture of exclusive Western-style hotels, designer shopping malls, traditional Islamic architecture, and street markets. Oil revenues have helped Kuwait City rebound from the Gulf War and the building boom shows no signs of slowing down. Today we have a guided tour of Kuwait City. We will begin with one of Kuwait's most famous landmarks, the Kuwait Towers, an iconic landmark on Kuwait's skyline. We also visit the Tareq Rajab Museum, a private collection of the Rajab family. The museum deals with calligraphy, pottery, metalwork, glass, wood, ivory and jade carvings of the Islamic world. Early calligraphy is presented in a separate small room, showing pages from the Holy Qur'an, dating back to the first three centuries of the Islamic period. There are also displays of costumes, textiles, embroideries and jewelry of the Islamic world. We also visit the Bayt Al Othman Museum, with a vast display of popular Kuwaiti culture and history in a large traditional complex of inter-connected ancient houses and courtyards. We will also have a chance to photograph and admire the very photogenic dhow harbour and fish market. 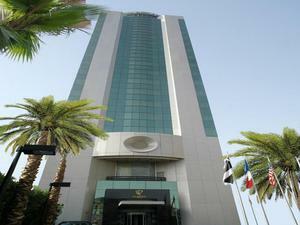 Today we fly from Kuwait to Bahrain and transfer to our hotel. Frequently called the Pearl of the Arabian Gulf, Bahrain is an archipelago of 33 low-lying islands located in the heart of the Gulf, and offering a blend of ancient and modern. This is a place where modern skyscrapers share the landscape with majestic mosques, embodiments of Islamic art, culture and architecture. Rich in history, Bahrain was once part of the ancient civilization of Dilmun and served as an important link in trade routes between Sumeria and the Indus Valley as long as 5,000 years ago. Manama is Bahrain's modern capital, and is dominated by a Manhattan-style skyline. Today much land, including the diplomatic area, has been reclaimed from the sea. Today will be spent exploring this tiny island state. We begin with a visit to the Bahrain National Museum where we will trace the archaeological development of the region. Through sculpture and ceramics, reconstructed burial mounds, Arabic calligraphy and illuminated Korans, the different periods of Bahrain's history are presented. We will also visit the Bahrain Fort. The first dwellings on the site are believed to have been constructed around 2800 BC, and have subsequently been overlaid by numerous fortified settlements. The last was built in the early 16th century to defend Portugal's recent acquisition of the islands; for this reason, it is also known locally as the Portuguese Fort. We will also pay a visit to the Al Fatih Grand Mosque, Bahrain's largest mosque and a magnificent piece of architecture. On the Island of Muharraq we visit Shaikh Isa House, in the old town of Muharraq. This was once the home of the Amir's great-grandfather, Shaikh Isa Bin Ali Al Khalifa. It provides a fine example of local architecture, complete with wall carving and latticework, and representative of traditional 19th century life. The house is complete with a 'wind tower'; constructed 5-6m (16-20ft) above the house and open on all four sides. One of the early forms of air conditioning, this acts as a funnel, catching the breeze and drawing it down into the cavities below, as well as allowing the release of hot air like a chimney. No visit to Bahrain would be complete without a tour of the Old Souk, with its profusion of colours, sounds, and aromas. The souk lies in the centre of the old town, near the archway of Bab al-Bahrain and, although much of the surrounding area is modern, the street layout and division of occupations still follow traditional lines. All wares are sold, from cloth of different colours and textures to gold and jewely as well as the traditional array of spices and local produce. Time permitting, in order to sample some of Bahrain's past, we will make a visit to the A'ali Burial Mounds. In order to sample some of Bahrain's past, we will make a visit to the A'ali Burial Mounds. This is the site of what may be the largest prehistoric cemetery in the world, with approximately 170,000 burial mounds dating from between 3000 BC and AD 600. We will also visit the pottery makers at A'ali village. This time-honoured industry has been handed down from generation to generation. The clay used for pottery, which is the centre of the industry in Bahrain today, is made from a blend of two types of clay. These are combined to create the optimum blend for their products, which range from traditional bread ovens to water pipes, plant pots, and moneyboxes. Kilns are frequently located inside the surrounding burial mounds, and the smoke given off can sometimes be seen from a distance as you approach the village. We will also visit Jasra House, built by Sheik Hamad in 1907 and the birthplace of the present Amir in 1933. We will drive out along the Bahrain -- Saudi Causeway, the symbolic and actual link between Bahrain and Saudi Arabia. This evening we fly to Abu Dhabi, largest of the Emirates and its ultra-modern capital on the Arabian Gulf. This morning we do some touring in and around Abu Dhabi. Although the city was founded in the late 18th century, the city exploded with oil wealth in the 1960s and the city was entirely rebuilt. There are almost no buildings in the city more than 30 years old. However, Abu Dhabi's citizens are very proud of their fabulously rich city with its broad avenues and futuristic buildings. The city's architecture is an intriguing interpretation of Islamic designs crafted in modern materials. We will see the magnificent waterfront corniche and visit the Sheikh Zayed Grand Mosque, Abu Dhabi's most iconic landmark, which features eighty-two white domes. Built between 1996 and 2007, it was designed to be an architectural wonder that incorporated both modern and classic Islamic artistic styles. Greek and Italian white marble covers the exterior, while Islamic calligraphy decorates the inside. We'll also visit the new Louvre Abu Dhabi, which is the result of an unprecedented initiative that laid the groundwork for a new type of cultural collaboration of unparalleled scope between two countries. The museum brings the Louvre name to Abu Dhabi and presents both ancient and contemporary works of historic, cultural, and sociological interest from around the world. Later we continue to Al-Ain, the "Garden City." We cross the desert to this attractive and relaxed city, cradled by the jagged Hajar Mountains on the Omani border. Today in Al-Ain, we discover its history and see its Bronze Age relics, picture-postcard Al Jahili Fort, former royal palace, two museums, and "falaj" irrigation channels. Al-Ain is the birthplace of Sheikh Zayed bin Sultan Al Nahyan, the first president of the United Arab Emirates, and it has the country's highest number of Emirati nationals. Al-Ain has been inhabited for over 4,000 years, with archaeological sites showing human settlement at Al-Hili and Jabel Hafeet. These early cultures built "beehive" tombs for their dead and engaged in hunting and gathering in the area. The oasis provided water for early farms until the modern age. Today Al-Ain is a popular vacation destination, away from the humidty of the coast, and enjoyed by the Emirati and expatriates looking for a break from the hubub of Dubai. Today we tour Dubai to observe the city's layout and modern architecture. During our time in the city we will marvel at some of the wonders of Dubai. Dubai is the synonym of business and luxury that became a paradise for travellers. Known as the city of superlatives, it has transformed its skyline with creative and inspired architecture. Home to some of the most amazing futuristic mega projects in the world, Dubai has the world's tallest building, the tallest hotel, the largest shopping mall, the iconic Palm and World Islands, and also features a ski resort in the middle of the desert. The Emirates Towers are two of the most prestigious buildings on Dubai's skyline. The Burj Al Arab Hotel, built in the shape of a billowing Arabian dhow sail and dominating the Dubai coastline, is one of the world's most spectacular and incomparably luxurious hotels (entry to no-residents is not permitted, but we will view this building from the outside). With its striking wave-like design, the adjacent five-star Jumeirah Beach Hotel is another of the architectural wonders that graces Dubai's skyline. Infinity Tower is the world's tallest high-rise building with a twist of 90°. The Princess Tower is recognized by the Guinness World Records as the world's tallest residential building since 2012. Towering over Dubai Marina skyline at 414 meters (1,355 ft.), the 101-storey skyscraper houses 763 luxury apartments, one of the most expensive properties in the city. We'll travel to the observation deck of the Burj Khalifa, the world's tallest building, for stupendous views. Although an ultra-modern city in many respects, much of Dubai's heritage has been retained. We will visit the Dubai Museum, housed in the restored Fort Fahidi. Inside this mud-walled fort dating back to the early 19th Century, the displays chronicle the long history of the Arabian Gulf. From the museum we will explore the 'Creek' area and see the old houses in the Bastakia quarter. A visit to this district is a step back in time to the days before electricity and air-conditioning, where wind towers cooled traditional courtyard houses. Many of the old wind tower houses were built by the wealthy merchants of the past, and Old Dubai was famous for these towers lining the Creek on both sides. We end our day with a journey across the Creek by water taxi, known as an "abra". The abra is a wonderful vantage point from which to see the modern and old buildings sitting along the Creekside. On the other side of the Creek we will set out on foot to navigate through the bustling alleys towards the spice and gold souks. Today we include lunch instead of dinner. From Dubai we travel north by road to the third largest of the emirates, Sharjah. Spread out along the Khalid Lagoon, Sharjah is an old trading centre with a laid-back feel. From here we travel via a panoramic coastal road overlooking the Gulf of Arabia and the Straits of Hormuz. Our destination is Khasab, local capital of the Governorate of Musandam, the "Norway of Arabia". The Musandam Peninsula is completely separated from the main body of Oman by a stretch of land belonging to the UAE. Musandam has developed distinct language dialects and cultural mores. A huge pale limestone massif with steep strata crossed cliffs descending into the sea, the peninsula has remained isolated from the rest of Arabia and is still very remote. The area is sparsely populated by the Shihuh tribe, who for centuries have been carving a precarious existence from the seas. Some villages can only be accessed by boat. On arrival we have a city tour,* including the restored Portuguese Fort of Khasab, a museum where many Omani handicrafts items are displayed. We will also pass by the prehistoric rock carvings depicting camels, ships and warriors in the neighbouring village of Qadah. * We may accomplish this sightseeing tomorrow if time constraints dictate. Mountains dominate the Musandam landscape as they rise straight from the sea creating a fjord-like coastline (hence the Norway comparison) that is unique in the region. This coastal zone, along with many offshore islands and inlets, abound with wildlife, including seabirds, dolphins, and whales. After boarding our traditional Omani dhow pier side, the cruise will take you toward Musandam's longest and most spectacular fjord, which is often referred to as 'Norway of the Arabia'; calm, turquoise waters contrast with the creamy white limestone cliffs. Along the way we will pass small fishing villages and perhaps even encounter dolphins. The dhow will anchor in the vicinity off Telegraph Island, allowing you to take a swim (bring your suit!) or just sit back and enjoy soft drinks, tea or coffee while admiring breathtaking views of mountains rising in the distance to over 2,000 feet. Our cruise continues with lunch provided on board. After the tour leisurely cruise back to Khasab. We have an early start today, departing by by a 4-wheel drive vehicle (closed and air-conditioned). Driving is partially on winding mountain roads; we will be able to enjoy some of Oman's most stunning sceneries. We board our 4-wheel drive vehicle and get ready for an exciting and breathtaking trip to Jebel Harim (translated as the Mountain of Women). With a height of 6,260 feet it is the highest peak on the Musandam Peninsula. During your journey to Jebel Harim, you will be able to enjoy incredible vistas, including terraced mountain villages, lush Acacia forests and wadis (dry river beds). Following a drive of a little over an hour, a stop will be made at a Bedouin village located at an elevation of 3,000 feet. The village of Sayah, surrounded by palm groves, is one of the most picturesque villages on the Musandam Peninsula. After a stop for photographs and to enjoy this idyllic setting, we continue our drive to Jebel Harim. There will be time to admire the grand panorama from the mountain's summit. The return drive takes us past Khawr Najid, a stunning sea viewpoint overlooking the Indian Ocean. We stop at Al Khalidya Nature Park before concluding our adventure back at Khasab. We then fly to Muscat, Oman. Oman has a population of only 3 million living in a country of over 300,000 sq km (117,000 sq miles). Most of the people live in or around Muscat, the capital. The cultivation in the Batinah, and hence the villages, is concentrated in a narrow strip along the coast where about half of the cultivated land in all of Oman is located. The palm groves are densely green sheltering limes, bananas, pomegranates, figs, papaya, mangoes, guavas, and vegetables. Fishing is also very important in this area. Muscat is not actually one town, but rather three separate towns, plus several associated towns all separated by geographical features of the mountainous, indented coast. Time permitting, we may accomplish some of our Muscat sightseeing upon arrival. Oman's position on the Arabian Sea/Indian Ocean, and its isolation from the rest of Arabia have given the country a much more outward orientation. Trade from Oman to India and Africa has been conducted for thousands of years. During the age of the European empires in India and Africa, Oman developed strong ties to Britain. Sharing the mountainous south coast of the Arabian Peninsula with Yemen, Oman shares many features with its western neighbour, including aspects of their dress and architecture. In ancient times this area was where highly prized Frankincense was grown and exported. Today our sightseeing includes the Sultan Qaboos Great Mosque. * After a lunch break we'll visit the Old Palace Area (from the outside), and the fabulous National Museum. * If this day falls on a Friday, some of our sightseeing may be accomplished tomorrow. Today we depart Muscat by road to the Bimmah Sinkhole, a giant depression where sea water has merged with fresh. Two flights of steps take you down to a dazzling pool of blue and green water. After a lunch break at the sinkhole, we continue past Wadi Shab and Wadi Tiwi. This is a region where we can savour the atmosphere of traditional Oman, as it was before the days of oil. Towns here prospered centuries ago on the trade with Africa and Zanzibar coming through the Omani port of Sur. Fine houses and forts were built and many of them still stand today, set back from the road behind the modern buildings. Most of the desert area of Oman is a flat gravel plain but the Wahiba has huge ridges of orange sand dunes separated by valleys. The few Bedouin who still live here breed fine camels. Oman is not principally a land of sand deserts but rather a dramatic area of dry, jagged mountains with narrow river valleys (wadis) between. The evidence of Oman's tribal past is everywhere, with ruined forts commanding every important vantage point. Much of Oman remains hidden in remote valleys and there is a feeling of self-imposed isolation here at the tip of the Arabian Peninsula. Sur's historical importance is based on the building of dhows, the wooden sailing vessels used to sail to India and other countries from Sur. We may visit the dhow building yard if there is any activity to observe (in recent times, the number of dhows being built here is unfortunately very few). Sur was an important port in ancient times, but really came into its own when Oman started to trade extensively with East Africa. Merchants here made fortunes from the trade in slaves and cloves, and used the profits to build elaborate houses. We will learn of Sur's history and its role in shipbuilding. Later we transfer to 4x4 vehicles for our foray into the Omani desert for a desert camp experience. Our camp is located within the breathtaking golden sands of the Oman desert, called the Wahiba Sands. Gas is used for the cooking and refrigeration; paraffin lamps and candles provide light. The camp is therefore a very peaceful place to relax and to experience authentic desert nights. Our accommodation is in the form of well-equipped huts (called Barasti) with comfortable beds (mattress, blankets, pillows and fresh sheets), and private bath facilities. Our huts are basic but cozy, and a wonderfully atmospheric way to enjoy the desert way of life and to learn about the local culture in a warm and friendly environment. Activities include sunset admiring, musical entertainment, and stargazing. Overnight at Wahiba Desert Camp. We recommend an early wake-up in order to observe the rising sun over the dunes. After breakfast we depart our camp and head toward Nizwa, the main town of the interior province. En route we experience the inland side of the great mountainous backbone of Oman, where sands lap at the thresholds of farmlands, and a string of border towns marks the zone of transition between nomadic and settled peoples. In the oasis villages of Oman, desert and village economies have mingled for ages to their mutual benefit. Living within and along the sands are approximately 3,000 pastoralist Bedouins belonging to different tribes, who are primarily herders of goats and camels. Forts and castles are Oman's most striking cultural landmarks and have historically been used as defensive bastions or look-out points. It is estimated that there are over 500 forts, castles and towers in Oman. Today we will visit a few of them that are particularly remarkable in their architecture and style. Included is a stop at Bahla Fort, a UN World Heritage Site. We continue our drive to Jabreen Castle, built as a defensive stronghold. Jabreen is perhaps the finest of Omani castles, with dungeons, passages, rooms and ceilings decorated with fine carvings and paintings. This castle is distinguished by the inscriptions and frescoes that adorn its rooms; its ceilings are decorated with paintings and Islamic-era style inscriptions, and its doors are beautifully carved. We also explore the village of Misfat Al Abriyeen where we can see its fascinating history, agriculture and falaj watering system. The Jebel Shams, translated literally to "Sun Mountain" is the highest peak in Oman, often called the "Grand Canyons of Oman." We spend another day with our 4x4 vehicles, travelling up the Western Hajjar Mountains, where we can explore the old village of Al Hamra located at the foot of the hills. In this area we can enjoy the date plantations, ruined houses and the scenery. We also stop at Wadi Ghul and discover small villages hidden in the mountain ranges as we climb up the steep and winding road. We enjoy a walk to an abandoned village on Jabal Shams Plateau, an exciting route along steep canyon walls. This ancient donkey path follows the west flank of Wadi an Nakhar and leads to the abandoned village of As Sab. Our stroll provides spectacular views into Wadi an Nakhar and down to Al Hamra. We return to Nizwa for our overnight stay. Today we continue by 4X4 through breathtaking mountains scenery; terraced farming and beautiful mountain villages line our route, as well as great views especially of Bilad Sait Village. It is in these mountain areas where Omani honey is produced. Beekeeping has been practiced here since ancient times. The specialist bee keepers of northern Oman have developed great skill in obtaining honey and propagating bee colonies in a sustainable manner. Our guide will take us to one of the bee keepers to observe this traditional practice. Up on reaching the main road, we continue to Muscat along the fertile Batinah coast with its beautiful beaches, forts, fishing villages and places famous for camel racing and bull fighting. This evening we connect with our flight from Muscat to Salalah, the second largest town in Oman. Salalah is isolated far in the south east of the country, close to the Yemeni border. The setting here is magnificent, as Salalah faces the Arabian Sea/Indian Ocean, backed by hills. This morning, before heading along the coast and into the mountains in our four-wheel drives, we tour Salalah including the archaeological site of Sunhumran. In pre-Christian times this tiny area was one of the three centres of production for one of the ancient world's most highly prized and expensive commodities, Frankincense. This was the main area in which the Frankincense tree grew. Demand for this rare product was enormous in the Mediterranean region as it was burnt in huge quantities during religious rites in temples throughout the Roman world (Frankincense is a gum dried from the sap of a special tree that only grows in this area). We visit the site of Sumhuram, the port at the beginning of the Incense Route. We finish at the traditional boat-building village of Taqua, the "Queen of Sheba's Palace." You'll have a chance to shop for Frankincense at the market in Salalah. RHLAH S'IDAH / BON VOYAGE! 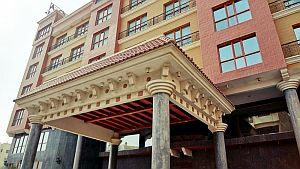 Located in downtown Kuwait city in the heart of the city’s business district, guests at this distinctive hotel can enjoy ...	access to upscale shopping, dining and entertainment. At Le Royal Tower Kuwait, guests can indulge and relax in the exceptional comfort of their rooms and take in the best that Kuwait has to offer. 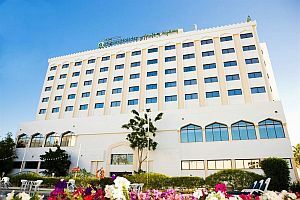 This unassuming hotel is 2 km from the Bahrain World Trade Center and 3 km from both the Bahrain National ...	and the Al Fateh Grand Mosque. Over 100 tastefully decorated rooms and suites, complimented by the warm hospitality that is unique to The Emirates. The hotel's ...	facilities are first-rate, including an outdoor swimming pool, spa, sauna, steam-room, and fitness center. Rooms feture: air conditioning, hair dryer, in room safe, television, bathtub, shower, mini bar. 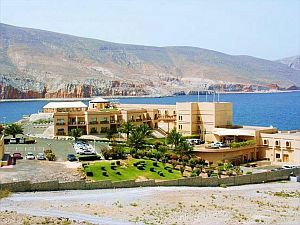 Set on a cliff overlooking surrounding mountains and the Strait of Hormuz, this elegant resort is a 3-minute walk from ...	beach and 3 km from the Port of Khasab. 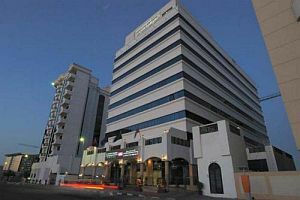 The Hotel Muscat Holiday is located in Al Khuwair within the capital area of Muscat, Oman, conveniently situated on the ...	between Muscat International Airport and the central business district. 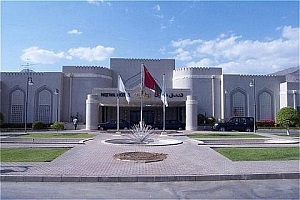 Amid this Arabian splendour stands Nizwa Hotel, an Oasis of peace and tranquility set against the magnificent Hajar mountains Just ...	short drive from Nizwa, the ancient capital, with its majestic fort and bustling souk, the hotel is within easy distance of other tourist attractions. Breakfast and dinner daily. All transport, accommodation, sightseeing and entrance fees for sites noted as 'visited' in the detailed itinerary. Gratuities for drivers, restaurant staff, porters, local guides. Airport transfers for land & air customers and for early arriving/late departing land & air customers who book their extra hotel nights through us. International airfare to/from the tour. Tour Leader gratuities, lunches, drinks, personal items (phone, laundry, etc), international (if applicable) and domestic air taxes, and any excursions referenced as 'optional'. Airport transfers for Land Only customers. Optional trip cancellation insurance. Our post-reservation trip notes offer further guidance on shopping, not included meals, visas, and locally-paid departure taxes. This tour is offered in winter when temperatures are the most pleasant. Jan/Feb is green season in some locations. At the time we run this tour, we can avoid the extreme heat and sandstorm summer season, though we will encounter warm conditions in some locations. Ground transport provided by private air-conditioned motor coach, 12-36 seats depending on ultimate group size. The tour is not strenuous though it is busy; you must be steady on your feet and be able to endure some heat and long travel days. We have numerous walking tours and visit several sites that are LARGE with steps and uneven surfaces. You must be independent with your own luggage at airports. Our difficulty rating level 2 refers to the ambitious nature of the itinerary and the lots of moving around that we do. Some days are long and we may have some early starts. Some mountain roads are also winding and rough and, although we use sturdy 4x4 vehicles for some of these journeys, it can be slow going; those sensitive to motion may be affected. Entry / VISA requirements for one or more of the countries visited require that your passport not show any evidence of a prior visit to Israel. Hotels used on tour are well-located, air-conditioned, 3-4-star properties with en suite bath/toilet. Single rooms are limited and possibly smaller than twins. Porters are generally available (see 'Inclusions').